[sysb,g] = balreal(sys) computes a balanced realization sysb for the stable portion of the LTI model sys. balreal handles both continuous and discrete systems. If sys is not a state-space model, it is first and automatically converted to state space using ss. For stable systems, sysb is an equivalent realization for which the controllability and observability Gramians are equal and diagonal, their diagonal entries forming the vector g of Hankel singular values. Small entries in g indicate states that can be removed to simplify the model (use modred to reduce the model order). If sys has unstable poles, its stable part is isolated, balanced, and added back to its unstable part to form sysb. The entries of g corresponding to unstable modes are set to Inf. [sysb,g,T,Ti] = balreal(sys) also returns the vector g containing the diagonal of the balanced Gramian, the state similarity transformation xb = Tx used to convert sys to sysb, and the inverse transformation Ti = T-1. If the system is normalized properly, the diagonal g of the joint Gramian can be used to reduce the model order. Because g reflects the combined controllability and observability of individual states of the balanced model, you can delete those states with a small g(i) while retaining the most important input-output characteristics of the original system. Use modred to perform the state elimination. [___] = balreal(sys,opts) computes the balanced realization using options that you specify using hsvdOptions. Options include offset and tolerance options for computing the stable-unstable decompositions. The options also allow you to limit the Gramian computation to particular time and frequency intervals. See hsvdOptions for details. This yields the following first-order approximation of the original system. 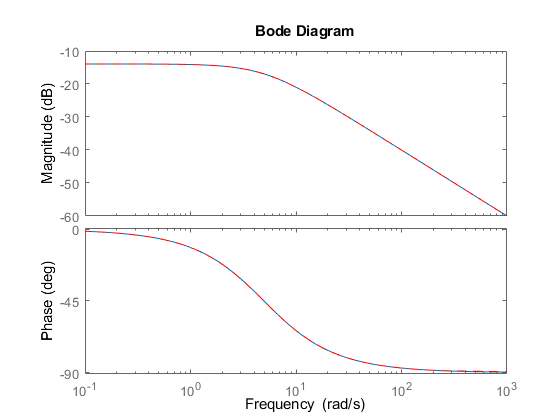 Compare the Bode responses of the original and reduced-order models. The plots shows that removing the second and third states does not have much effect on system dynamics. Apply balreal to create a balanced-gramian realization. The unstable pole shows up as Inf in the vector g.
See ,  for details on the algorithm. 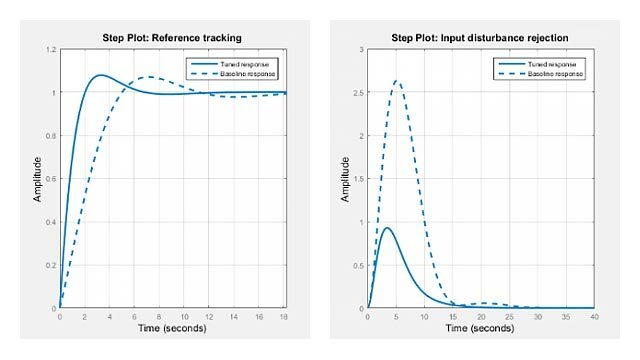 If you use the TimeIntervals or FreqIntervals options of hsvdOptions, then balreal bases the balanced realization on time-limited or frequency-limited controllability and observability Gramians. For information about calculating time-limited and frequency-limited Gramians, see gram and . Laub, A.J., M.T. Heath, C.C. Paige, and R.C. Ward, "Computation of System Balancing Transformations and Other Applications of Simultaneous Diagonalization Algorithms," IEEE® Trans. Automatic Control, AC-32 (1987), pp. 115-122. Moore, B., "Principal Component Analysis in Linear Systems: Controllability, Observability, and Model Reduction," IEEE Transactions on Automatic Control, AC-26 (1981), pp. 17-31. Laub, A.J., "Computation of Balancing Transformations," Proc. ACC, San Francisco, Vol.1, paper FA8-E, 1980.